This painting is called ' The Goddess Boann' – ' Dance of Delight' There is also another painting of the ' The Goddess Boann' and it is called ' Going with the Flow'. 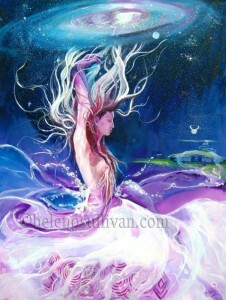 'Dance of Delight' is currently being shown in 'Chamarie' in Midleton. Co. Cork. The verse or poem that I have written below is for these two paintnings.